In the aftermath of the recent political and market turmoil in Italy, last weekend we were surprised to report that none other than JPMorgan came to the unexpected conclusion that what Italy's Euroskeptics are hinting at, if not explicitly pushing for, namely Exitaly, may be the best option for the country, however one which would not take place without major market turbulence. ... leverage which is further compounded by Italy's surprisingly favorable current account balance and Net International Investment Position (more details here). So fast forward just a few days, when later last week the Bank of Italy released data on its aggregated balance sheet for May 2018 including its net Target 2 balance, showing a dramatic increase in its negative net balance. Indeed, the net balance deteriorated by nearly €40bn, its largest monthly deterioration since March 2012, to a new record of -€465bn. As JPM further details, on the Bank of Italy’s balance sheet, the increase in the Target 2 liability was largely matched by a decrease in deposits from MFIs even as the aggregate size of the balance sheet was little changed, which as JPM's Nick Panigirtzoglou writes, suggests the worst possible scenario: that some deposits were moved abroad. 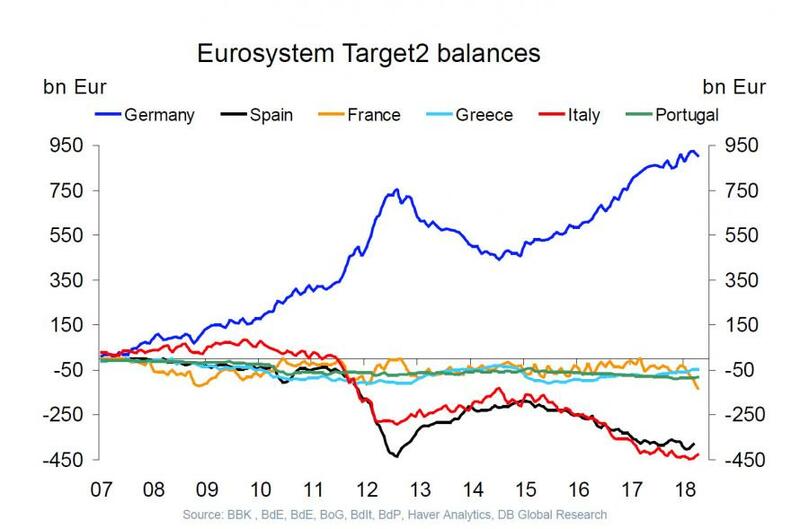 This is in sharp contrast with the period of rapid deterioration of the Target 2 balance during the escalation of the Euro area crisis from mid-2011 to mid-2012. At the time, the counterpart to increasing Target 2 liabilities came from an expansion in the Bank of Italy’s assets, primarily from an increase in liquidity provision to the banking system. 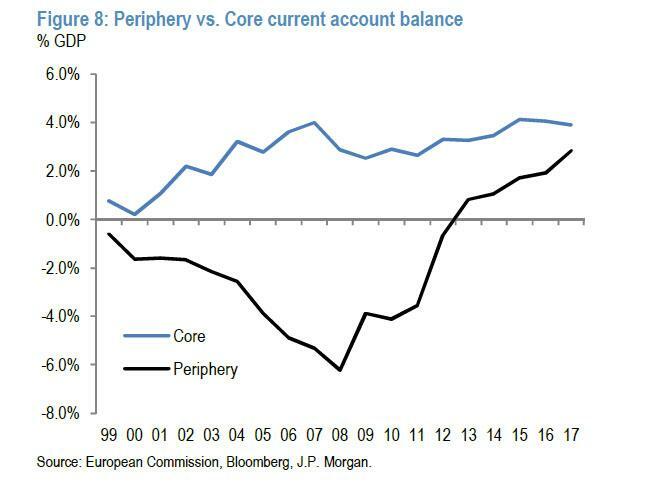 Indeed, the levels of excess liquidity in the Eurosystem given QE and the large balance of outstanding TLTROs reduce the need for such liquidity provision. general government) amounted to nearly €1.7tr as of March 2018. 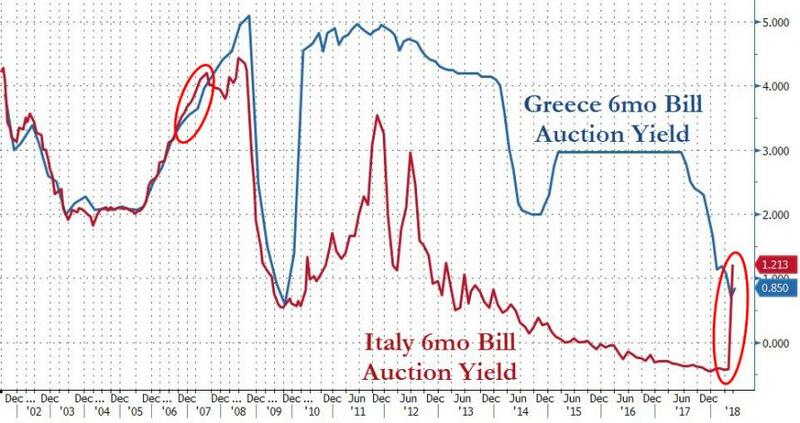 In short: with the risk of both Italeave and redenomination rising, the Italian savers are starting to pull a "Greece", something we observed on Friday in the dramatic spike in Italian bill yields above those of Greece. Which brings us to the next "big question": how long will the Italian authorities allow these outflows to accelerate before they too respond with whispers (at first) of capital controls.